No. 7 Hammersmith Terrace was the former home of Sir Emery Walker, an important figure in the Arts and Crafts Movement and friend of William Morris. He lived here from 1903 until his death in 1933, following which his daughter continued to live here. In 1999 the house and its contents was bequeathed to the Emery Walker Trust. The house has a complete Arts and Crafts interior, and the small cottage-style rear garden retains much of the style of Dorothy Walker's planting. Has taken part in Open Garden Squares Weekend 7 times, most recently in 2018. Admission charge. No photography inside the house. Hammersmith Terrace is a fine row of Georgian houses dating from c.1750. No 7 is the former home of Sir Emery Walker (1851-1933), founder of the Doves Press, and an eminent typographer, engraver and printer linked to the Arts and Crafts Movement. He was a friend and mentor to William Morris who lived nearby at Kelmscott House (q.v.). Emery Walker had lived in this area for many years; he lived in No. 3 from 1879 and in No. 7 from 1903, a house previously occupied by T J Cobden-Sanderson, the bookbinder. After Sir Emery's death in 1933, his daughter Dorothy Walker continued to live in the house until her own death in 1963 when she left the house and contents to her companion, Elizabeth de Haas. 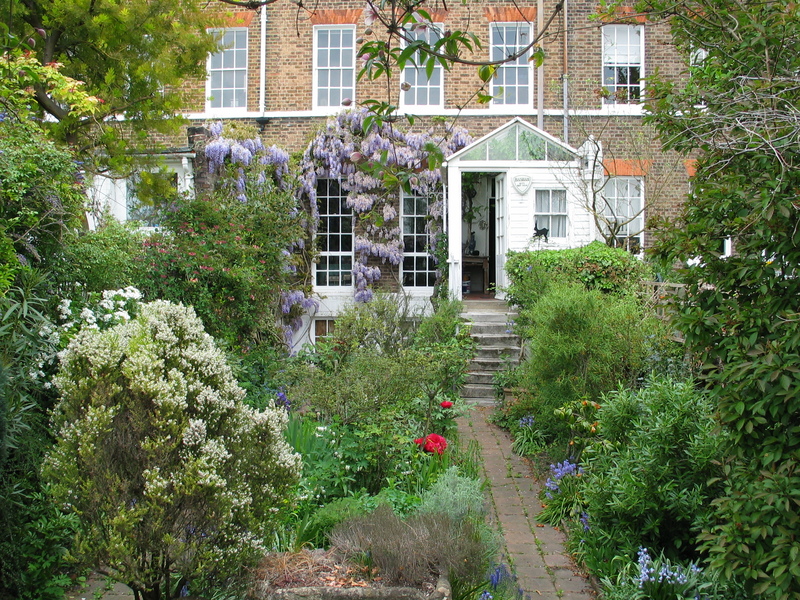 Miss de Haas lived here until her death in 1999 when in turn she bequeathed the house to the Emery Walker Trust, who first opened it to the public in 2005. The house has a complete Arts and Crafts interior, with William Morris wallpapers, textiles and furniture. The Trust's object is the 'advancement of the education of the public in arts and crafts design and architecture... by promoting... the study and appreciation of artists, craftsmen, designers and architects of the 19th and early 20th centuries and their works and the Arts and Crafts movement, and acquiring and thereafter conserving, maintaining and displaying 7 Hammersmith Terrace and its contents'. At the rear of the property is a delightful small cottage style garden with wisteria covering the back wall; a path leads to the back door up a short flight of steps.